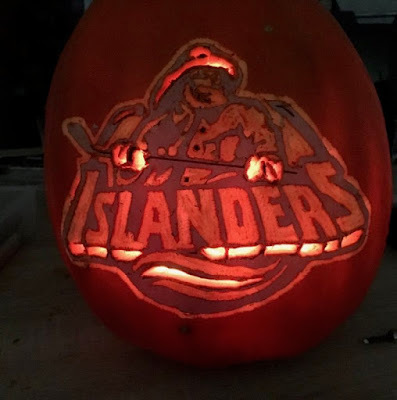 Hockey Blog In Canada: Happy Halloween! It's All Hallows Eve, folks! That's not my pumpkin above, but I really wish it was. The Fisherman rules! Tonight will see me handing out candy and goodies to all the little monsters and ghouls that venture up to my door with the proper password (hint: say "Trick or treat!"). I'll hopefully see more than the dozen or so kids last year, but I'm prepared if it's around the same total this year. I find that total weird because I live in an area where there are legitimately a number of families with kids, I'm about a block away from an elementary school and a community center, and yet I see very few kids doing the Halloween march down my street. Anyway, I'll be watching The Equalizer 2 with Denzel Washington while I await the scary minions of candy collecting, so don't expect any hockey chatter tonight. It's nice to have a night off once in a while, so tonight's the night for me. Happy Halloween, folks, and may your sweet tooth be satiated with all sorts of sugary goodness tonight!